Fingerprint sensors... they're just about everywhere these days. Of the latest new flagships, all of them have a fingerprint scanner (is there a difference between a sensor or a scanner?). Anyways, they're here now. And I kinda like them. Especially if they're super simple to use like the Nexus 6P or the HTC 10 where you barely have to even press it to work. Well, LG (being the innovative company that they are lately) is going to go one level 'deeper' and put the fingerprint sensor underneath the glass. Now there's no real extra magic here - I was expecting to find out that they would have the whole screen as a sensor, and I can tap anywhere I like (that'd be awesome eh?). They're just carving out the underside of the glass in a specific spot (you can see like they show in the corner there) and have the sensor there. The glass will be thin enough in that spot where it could still read appropriately. One less button to have to worry about (would really have helped HTC with theirs as it looks like it's just sitting out there in no-man's land). Seoul, Korea, May 2, 2016 – LG Innotek (CEO Jongseok Park) today announced an under glass fingerprint sensor module. It means you just placed your finger on the cover glass of the phone and then it identifies your fingerprint. This module gives the freedom of the smartphone design and even enhances the user-friendly function, for example, waterproof or protection from any damage. Previous 'button type' modules required you to press a finger on a raised square or circular button for your fingerprint to be read exactly, so the sensor was usually mounted on the front, rear or side buttons of a smartphone. LG Innotek cut a shallow furrow of 0.01inches (0.3mm) thick on the lower backside of the cover glass and installed the fingerprint sensor inside of it with using their supreme precision and combination technology. With this module, the sensor is not exposed to the outside of the device, so manufacturer can produce a sleek designed smartphone. Fingerprint recognition area also can be indicated by various patterns up to design of complete product. High-strength cover glass protects the sensor and prevents it from coming in direct contact with water or damage from scratches. At the same time, the new module secured the fingerprint recognition accuracy compared to the button type. The new module has a false acceptance rate (FAR) of 0.002%. The FAR is the probability that the system falsely recognizes someone else's biometric information as that of the user. 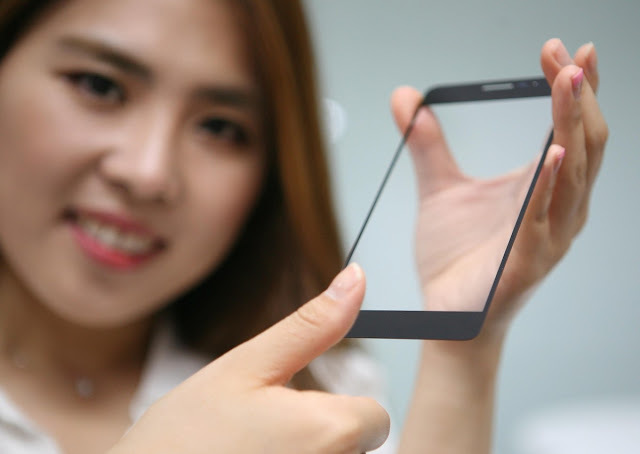 LG Innotek developed a proprietary adhesive to be used to attach the sensor to the glass, securing the commercialization scale of the durability including high impact absorption. The adherend side of the sensor and glass is only 0.0098inches (0.25mm) thick, but it endures impact of 4.6 oz (130grams) of the steel ball dropped from 7.9inch (20cm). LG Innotek expects that demand for fingerprint recognition technology will dramatically increase due to the expansion of the mobile payment market, has a plan to secure the new customer. Market research firm, IHS, reports approximately 499 million fingerprint sensors have been sold globally in 2015 and expects that number will increase to 1600 million units in 2020. Changhwan Kim, Head of the company's R&D Center said, "We are concentrating on all our resources to the development of the differentiated technology based on the creation of customer values." "We will continue to provide convenient, safe, and pleasant user experiences by launching innovative product."